Where Are the Best Southern Utah Canyons? Southern Utah’s gorgeous landscape of towering red rock spires, smooth sedimentary rock walls, and deep canyons are the region’s biggest attractions. Most travelers visit the area for the hiking trails and canyoneering opportunities. If you’re planning a trip to the area and want to experiment with the many outdoor recreation activities, you should read our guide to some of the best Southern Utah canyons! At these, you can explore on your own or choose to take a guided excursion. Let Family Time Vacation Rentals help you cut your travel planning time in half by requesting our complimentary Vacation Guide! This carefully curated planner includes dozens of insider tips and recommendations on top activities and attractions. Learn more about other Southern Utah canyons as well as hiking trails, fishing spots, and more. Some travelers seek individualized experiences that allow them to explore an area at their own pace while others prefer the expertise of a tour guide. Whichever type of traveler you identify with, there are plenty of ways to explore Southern Utah canyons. If you’re an experienced canyoneer, you may want to try hiking through some of the many slot canyons in the region. Stop by one of the national parks to witness the most popular canyons from a cliff-top view. The shifting rock layers of the Colorado Plateau have played an essential role in the formation of Zion National Park. This famous canyon site was created by a river flowing through the rocks, carving a deep gorge over thousands of years. Bryce Canyon National Park’s well-known valley was also forged by a similar process. However, the multitude of slot canyons in the area followed a slightly different course of action. This particular type of canyon is very deep and narrow, allowing just a small sliver of space to navigate. Though flowing water is the primary cause of these gorges as well, slot canyons require very specific conditions. Softer rocks plus the right amount of rainfall or runoff will result in these stunning canyons with smooth, multi-colored walls. Outdoor adventurers favor the slot canyons in Moab. Southern Utah is often named as one of the regions with the highest concentration of slot canyons. If you’re considering a hike through these confined gorges, be aware that it can be a challenging expedition. A guided excursion is recommended for those who have never embarked on an adventure of this nature before. You can explore some of the best sites in the area by visiting Peek-a-Boo and Spooky canyons, Buckskin Gulch slot canyon, and Burr Trail’s singing canyon. Zion and Bryce Canyon national parks also offer stunning views of iconic canyons. Though these gorges are much wider than the many slot canyons, they are more easily accessible. With a nearly countless number of beautiful sites, Zion National Park features trails for all skill levels. While exploring this park, be sure to check out Kolob Canyon. Bryce Canyon may be one of the most popular Southern Utah canyons and also includes dozens of trails for families, experienced hikers, and first-time canyoneers. For easy access to the Southern Utah canyons, book one of our many Family Time Vacation Rental properties near national parks. Our Arched Oak Acres rental is centrally located to nearby parks, making it the perfect property for anyone planning to spend a lot of time exploring these areas. With room to accommodate up to 14 guests, this location is excellent for multiple families traveling together or large groups. Take advantage of the huge yard and outdoor grill. 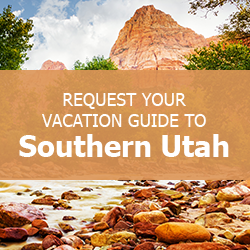 Browse a complete catalog of all our available properties and start planning your Southern Utah getaway today! We can’t wait to make your trip unforgettable.